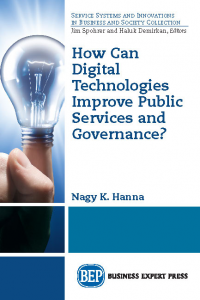 Dr. Nagy K. Hanna is author, educator, public speaker, and global expert on digital transformation and innovation strategies. He has over 40 years experience advising countries and aid agencies on digital economy, e-transformation policies and strategies, e-government, e-leadership institutions, knowledge services industry, connectivity, public sector reform and governance, and innovation-driven development strategies. Visiting professor, Wits University, South Africa. Advisor to governments, World Bank, ICT multinationals, and major consulting firms on cutting-edge ICT policies and strategies. He is a Senior Fellow and Board Member of the Center for Policy on Emerging Technologies; founding member of People-Centered Internet at Stanford university; and member of editorial boards of several journals including Springer’s book series on Innovation, Entrepreneurship, Technology and Knowledge Economy. Taught at University of Maryland, George Washington, and Duke. Led or participated in development policy dialogue in over 50 countries. Published over 100 articles, papers and book chapters, and authored/co-authored 24 books. Over 30 years, he held many positions at the World Bank, including senior advisor on national ICT strategies, lead evaluator of development effectiveness, lead corporate strategist, lead economist, and senior operations officer. He holds PhD from the Wharton School, University of Pennsylvania. Completed Executive Development Program at Harvard.